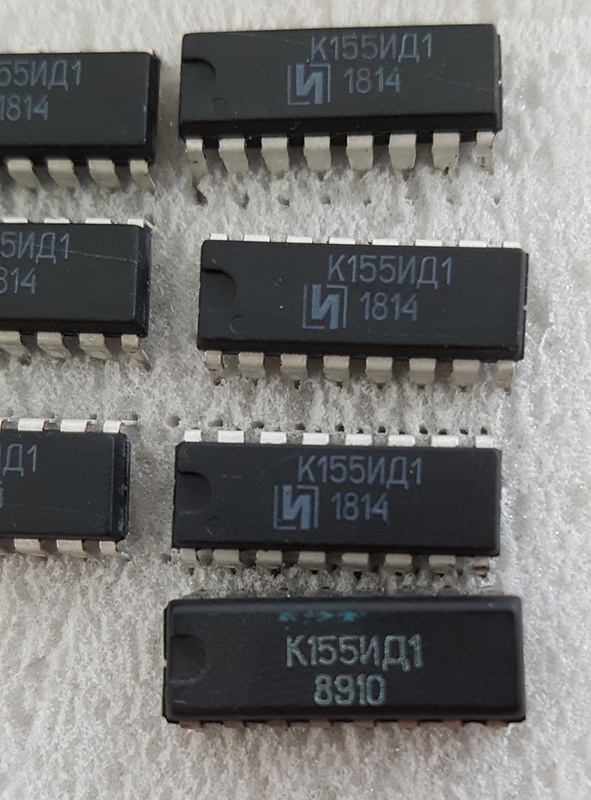 [SOLVED] Help identify the IC manufacturer: is it really possible that these ICs from the 60&#39;s just made a comeback (К155ИД1)? [SOLVED] Help identify the IC manufacturer: is it really possible that these ICs from the 60's just made a comeback (К155ИД1)? So we've been manufacturing Nixie Clock kits for the last few years, and for the multiplexers we used 74141 ICs, or their Soviet clones (К155ИД1). The latter were easier to find on ebay and were used more commonly. These chips have a date code like "8910" which I assume to mean year 1989, week 10. Since this is all NOS (New Old Stock), I've made a 74141 tester to verify incoming batches. I received the latest batch of chips yesterday and to my surprise about 1/3 of them failed the tests. Then I noticed that these new chips were visibly different: the plastic package is more edgy, there's some sort of manufacturer logo, and their date code is "1814"! I later verified that the new chips work on actual nixie clocks, but my tester rejects them for some minor reason (probably the new ones are a bit more sensitive to supply voltage, they also seem to be consuming a tad more current). Is it really possible that these ICs from the sixties have just made a comeback? The practical upside of this is that we'd be curious to contact the new manufacturer directly, to cut the ebay middlemen. I thought so, but they seem to be a bit different as far as characteristics go, which seems to suggest they aren't 1:1 the same. I have a microscope and if I have the time I'll delid one old and one new, to compare the chips themselves. The neonixie page shows photos of russian '141 with a date code suggesting 2006 manufacture. .... Could we be dealing with '145s bonded differently here? You have К155ИД1 1814 chips made in Belarus see this. Company name is Integral. К155ИД1 8910 is a very old chip made in 1989. Unfortunately, these old chips are hard to find. The Soviet Union made excellent chips; now you need to carefully verify the modern versions. The chips that you have are made in Belarus by a company named Integral. К155ИД1 1814 :- This is a recently manufactured chip. (i.e. 14th week of 2018). К155ИД1 8910 :- This chip is very old (i.e 10th week of 1989). Link to the site of manufacturer. Searching on their website for the part number doesn't seem to turn anything up. @undercat the link redirects me to the main page. This one works: integral.by/ru/products/ttl-seriya-k155-ekf155/k155id1 BTW their web certificate expired yesterday 2019-02-09. [SOLVED] How to identify SMD devices from the codes on top of the component? [SOLVED] Identify the manufacturer of these circuit boards?